For the first time in years, the Steam summer sale has a limited-time game attached to it. It’s called Saliens, and it’s, well, not very good. That hasn’t stopped dedicated groups of Steam users from trying to exploit the gooey-green alien crap out of it, though. Saliens is, at its core, a simple tower defense game. You hunker down and lob turret fire and special abilities at oncoming hordes of enemies until time runs out. The art isn’t great, and you’ll probably get carpal tunnel if you play for more than ten minutes at a time. However, there’s also a larger metagame underlying it all, and that’s what’s got people grouping together in hopes of achieving intergalactic dominance. 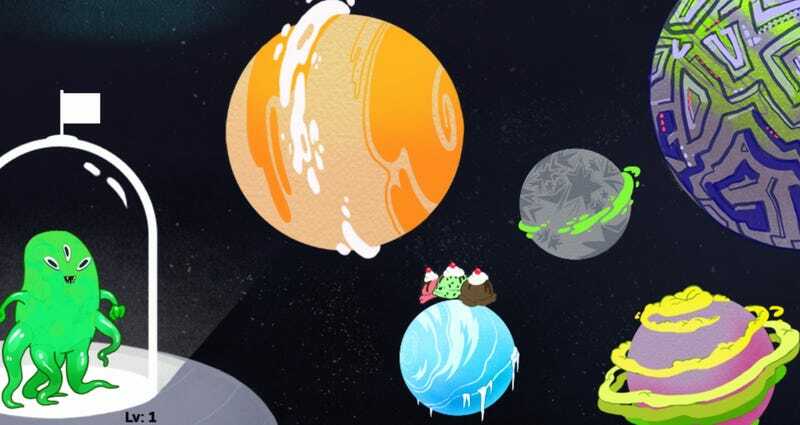 See, you can win free games by playing, and you up your chances of nabbing free stuff by spending time on in-game planets, each of which are named after the types of games on offer— “Planet of the mold-breaking Metroidvanias,” for instance. If you play in conjunction with a Steam group, you can take control of portions of each planet, assuming your group has the manpower to do so. Already, people have developed all sorts of scripts that allow them to play the game without actually playing the game. Some of these scripts even automate the process of moving between planets and selecting zones that maximize XP. Groups like the newly-created Saliens subreddit are using these scripts—as well as good old-fashioned coordination—to give themselves an edge over planet-stomping behemoths like the long-running, Valve-created Steam Universe group, which has over 1.5 million members. This exposes one of Saliens’ key flaws: overwhelmingly large groups kinda just win by default, even if only a fraction of their members are playing. The Saliens subreddit group has started to gain some ground, but most territories are controlled by Steam Universe. The other big flaw? The game is an absolute chore to play if you’re not using scripts. Some users even speculate that Valve designed it with scripts in mind, given how prevalent their use was during 2015's Steam summer sale Monster Game. “I just saw that it goes to Rank 6 badge,” said a member of the Saliens subreddit in regards to trading cards that can be crafted into badges, like many other games on Steam. “This game is made for scripting, because your hand will fall off trying to reach this manually.” Players have estimated that reaching even Rank 3 takes seven hours of incessant clicking and skill deployment. Here’s the weirdest part, though: at this point, players competing in groups aren’t entirely sure what they’re competing for. As I mentioned earlier, the only way to up your chances of winning free games from Saliens is to spend time on planets. The game counts this time whether you’re blasting enemies or not—but even if you’re doing that, your chances of winning free games are very low, given the number of people involved. Actually playing the game earns you cosmetic items for your Salien, trading cards, and of course, a chance at planetary dominance for your group. Not gonna beat around the bush here: that sure sounds like a fancy way of saying nothing. That’s not to say there is no appeal to playing the game, scripting, and all of that. After the game ends, players will get to display their customized Saliens in their Steam profiles, and given how much of a thing achievement spam games have become, it’s pretty clear that some users really like dressing up their profiles. But there doesn’t seem to be much of an incentive to win the larger metagame. Still, some players are hoping that Valve will surprise them with a prize when it’s all said and done. If not, well, perhaps the real reward for pulverizing your hands into bone powder is the friends you made along the way.